Use the right garden tool for quick and efficient landscaping. Each tool used should fit the task at hand and be comfortable to use. Choose well-made tools that will last for years with proper care and storage. Clean groundskeeping tools after use and avoid leaving tools outside where they will rust and wear quickly. Choose strong materials like carbon steel that will hold up to pressure and can be sharpened. Stainless steel tools are strong as well, and are easy to clean. Trowels are frequently used garden tools. Dig small holes, transplant seedlings and bedding plants, mix small batches of potting soil and more with a garden trowel. Trowels come in various widths and some have inches marked for convenient measuring. Shovels and spades are not the same tool. Use shovels to move dirt and garden soil around, but use a spade for its sharper blade and easier digging. A garden hoe is very useful for removing weeds from garden beds. Different styles suit specific jobs--short handled as well as long handled and those with specialized blades for scraping, look for hoes with strong blades and a smooth, comfortable handle. A sturdy leaf rake is useful for clearing leaves and debris. Rakes with adjustable-width tines can reach tight places or broad areas. 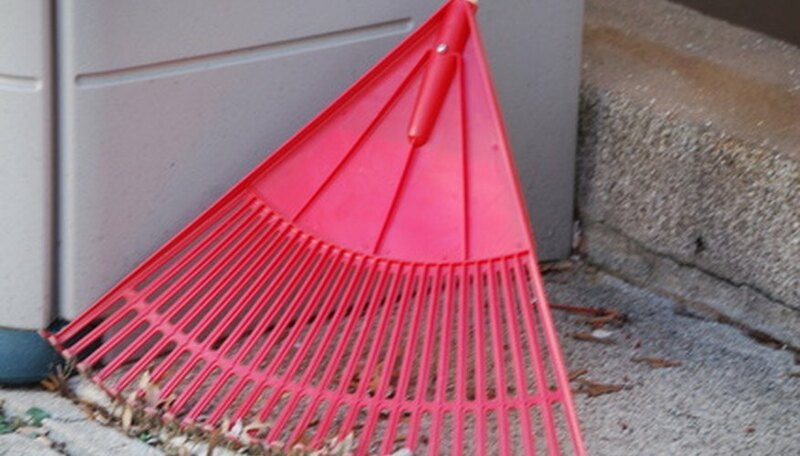 Construction rakes are heavier than leaf rakes and are used to level soil. Leaf blowers--electric, cordless or gas-powered--are useful but not essential groundskeeping tools. String trimmers, lawn edgers and debris shredders are useful landscape tools as well, but gardeners can do without them. Adjustable garden-hose sprayers and water sprinklers are very useful tools to help with irrigation chores. Lawnmowers are essential in almost all home landscapes. Lawnmower types range from small, rotary cylinder mowers all the way up to powerful garden tractors. Use a rotary, push mower for very small yards, but anything larger requires more power to get the job done efficiently. Use hand pruners for pruning branches and shaping plants. Choose the right size for the job--long-handled loppers make good, sharp cuts with little effort. Small, scissor-like clippers are useful for small tasks. Handsaws and pole-pruners for reaching high places are additional important landscaping tools. Keep all tools used for cutting vegetation clean between uses, and it's also a good idea to sanitize your hand tools with a bleach solution or alcohol to minimize the chance of spreading plant diseases.